By Mark - Thailand - 16 Dec/03 - Viewed 6463 times. At the dock we were offered a lift by a man and assumed he had a taxi. When we got outside we found we were going on the back of a motorbike (one each). It was quite scary as we had no helmets and only t-shirts on. Our drivers kept overtaking each other and as I was wearing my big rucksack I felt I was falling off the back. In about 20 minutes we reached Satun and another 5 minutes later we were at Farm Khai where we were meeting Caroline (she had gone on ahead from KL a few days earlier). At first we thought we must have come to the wrong place as it did indeed just look like a farm. A faded sign said "Farm Khai", but it had been spelt wrongly as Gai in the Rough Guide. A Thai man came out and we asked him if Caroline was staying there - he said she was so we decided it must be the correct place. He took us round the back of the farm building to an eating area and went to get Caroline. It only costs 150B for a bungalow with a porch and bathroom in a leafy garden (less if staying longer). Some people stay there for a long time and join in with the running of the farm. We were introduced to the owner - a man called Herman from Switzerland. He had a huge beard and looked a bit crazy but was very nice. We were the only people staying there. That evening we walked into Satun for some food. It takes about 15 minutes through a little village squashed between a river and a huge limestone cliff. There is no road, just a path wide enough for motorbikes. All the people there said hello to us as we passed. In Satun we ate at the night market. For 20B I had really nice chicken and rice. Laura had a bit of trouble ordering something vegetarian as no-one spoke English and we hadn't looked up the word in Thai yet. The next day we got a Sawngthaew to the dock and caught the fast boat to Ko Lipe at 11am. This costs 500B and takes about two hours. It had only just started running as it was the beginning of the high season. At Ko Lipe we had to transfer to a long tailed boat to get to the beach as there is no pier. This cost an extra 30B. We got bungalows at Pattaya 2 for 400B. Ours was on the cliff at the end of the beach with a view of the bay. The rooms were basic and badly made but had a nice porch to sit on. 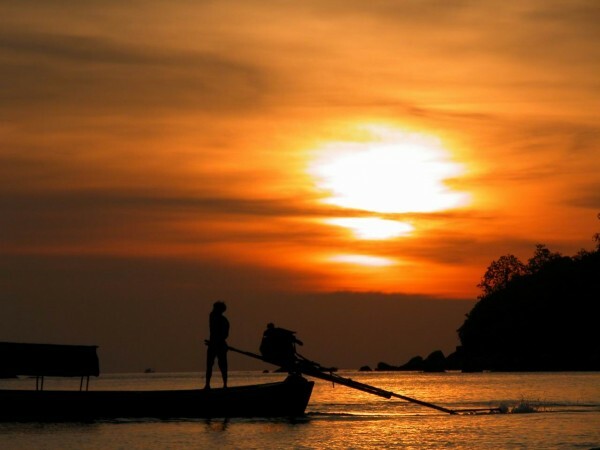 Ko Lipe has so far escaped the mass tourism found on places like Ko Samui and Ko Phi Phi. There are only about 5 places to stay - each with it's own restaurant. There are quite a few bars - tiny huts on the beach except for the Pooh Bar which is the only upmarket place and also has the only internet cafe on the island for a very expensive 300B per hour. There is a small Sea Gypsy village with a few shops operating from peoples homes. The two beaches are practically empty of tourists - it is a very relaxing place. So relaxing that we ended up staying eight days. The fish from any of the restaurants was delicious and only cost between 60B and 100B for a whole fish. Nearly everyone with a boat offers snorkelling tours so one day we organised a boat to take us to a few snorkelling spots on nearby islands. The number of fish was amazing and we even saw a lion fish and a seahorse. We also did a dive with Starfish Scuba. They were very proffessional and friendly but visibility was poor due to recent rains. Despite that we saw a leopard shark and lots of lion fish. The sea was quite rough and I was seasick for the first time ever - we also used a lot of oxygen at the surface as the waves and current were strong. On the last day we moved into one of the nice concrete bungalows with a better view as a treat. These cost 800B a night. Laura really didn't want to leave but finally we said goodbye and caught the boat back at 2pm. This time we avoided the motorbike taxis and got a Sawngthaew back to Satun. We stayed in the centre this time as we wanted to leave early the next day.